No, you're not looking at Godzilla. No, you're not looking at an upside down Gator. You are looking at a critter that fascinates me. They're shy little things that we tend to see in odd places here. The ones in the daytime are Anoles, not geckos, but for me, they're really the same thing since they tend to be in the same places. Upside down on the ceilings or glued to my calf because I scared it, they are common here. 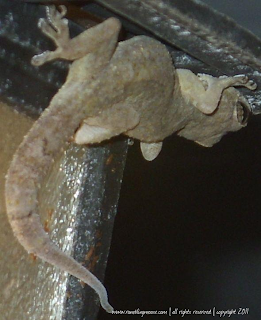 Anoles in the day, Geckos at night to this casual observer. One morning, very early, I heard a noise outside. Walking to the front door, I stepped out onto the front porch, looked up at the light, and there was this little critter trying not to be seen. I went back into the house quietly, grabbed my camera, and got this picture. My best guess is that this is a "Common House Gecko" which is not actually a native to South Florida, but introduced from other warm climate areas. Since they need warm climates, I'm amused by the story I have heard about Geckos in New York. The story goes that in order to control cockroaches in high rise condos and apartment buildings, people have set these Geckos out into them. The Geckos hunt the cockroaches and keep things down to a dull roar. Their eggs are a common sight in my shed. They're the size of a Pie Weight, and since the shed is shelter and warmer than outside, the incubation is a safe place for them. I just have to remember that these critters are out in my shed when I go to grab the tools to do some work around the property. I've had Geckos and Anoles both drop from the rafters onto me with a start. The other place I have to watch for them is in the Jeep. My Jeep is a 2002, so the roof on it is starting to get old. The threads that hold it together have begun to degrade due to the UV light here, and there's one seam that has popped open. You would not notice it, but the Geckos have. Yes, I have a Gecko RV. A Caravan for Geckos. I've even spotted the little guys while driving. I guess they figured that the sand filled Gecko that I keep on the dash of the Jeep to hold things down was a sign that they could consider it safe. At least for now, little guys... at least for now. For the of God! If one of those fell on me I'd probably be traumatized for life. YUCK! Thank goodness Jersey doesn't have these. Meghan, actually they're quite harmless. This kind is rarely longer than your middle finger, they have no teeth, and are very timid. Actually, a game around here with kids is to catch a gecko or anole and have it "bite" your ear lobe and have it like an earring. They fall off in a couple seconds.